Old men make amusing post-punk rockers. I see Green Day are touring NZ. 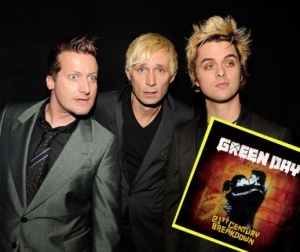 The last time they were there was on the American Idiot tour, and it was a fantastic show. Go if you can, I am going to the Hamilton, ON show in three weeks. 300 GA tickets, a maximum of 2 per person, are available from the box office of the venue, in this case Vector Arena in Auckland, the day tickets go on sale. Lets look at the second measure first. With a total capacity in the 12,000 range, Vector probably has a GA limit of at least 3,000. Therefore, this would imply that 10% of the audience - those lucky 150 people who work in downtown Auckland and can justify queuing for the morning - will get tickets through. Or, professional scalpers will pay a homeless guy $10 to queue and then take their place at 7.59am. 90% of the GA tickets, and presumably the total 11,700 other tickets, will go on the 'tubenet like always before. Which leads back into the first measure. Even if you're only sent a receipt, without Trade Me taking an active part, there will be auctions that read "$300 pen with free Green Day ticket receipt". New Zealand is both blessed and cursed to only really have one public marketplace, and it's one that has expressed no interest in not taking its cut of the auction proceeds in the past. Compare and contrast with what we have here: all GA tickets and the best seated tickets are pick-up on the night only, with the purchasing credit card. If this were matched with a facility where you can return unwanted tickets to the retailer for a fair refund (minus handling perhaps), and have them invalidated, and made available to the pool again - yes, this means checking back later could actually have good reason! - I consider this the perfect solution. Sure, there will be people who try and sell the invalidated tickets, but a number-checking web site could clear that up quickly. Now, on-street scalping will never stop, but it's probably not a bad thing that it exists. Fern and I went to see The Police on the strength of people standing outside who wanted to sell their tickets at face value (albeit a young couple, not the regular toothless hobo scalpers at the Air Canada Centre in Toronto). I even sold a ticket for R.E.M. in London to a scalper when we didn't have a fourth person who wanted to go. A couple of weeks ago, tickets for Game 5 of the Stanley Cup, the NHL ice-hockey finals, were going on the street in host city Detroit for 1/3 face value, owing perhaps to the fantastic economic climate in host city Detroit. Some friends of mine made the 3 hour drive down for Game 7, the final in the best-of-7, but by that point the scalpers had figured out which way up to hold their calculators and were charging between $500 and $2100. The game was instead watched from the Windsor Casino. You have to be prepared to walk away.